Located on the south bank of the Loire, the domaine spreads over the best vineyard plots. The Chateau du Hureau vineyard spreads over about twenty plots covering around 20 hectares, over the villages of Dampierre sur Loire, Souzay-Champigny and Saumur. 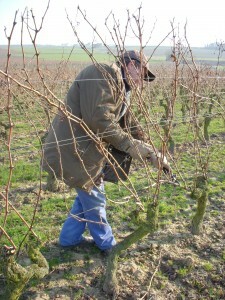 18.5 hectares are planted with Cabernet Franc, all of them within the appellation of Saumur-Champigny. The Saumur Blanc and Coteaux de Saumur come from 4 little plots of Chenin, representing 1.5 hectares. The local “Tuffeau” rock: the blessing of the Loire Valley! The whole vineyard is planted on the tuffeau, a sedimentary limestone from the cretacian era, with which all the Loire castles and houses were built. In addition to its aesthetic quality (just think: if the châteaux of Chambord, Chenonceau or Saumur had been made with another stone, they surely wouldn’t reflect the sun the same way), the tuffeau is also renowned to be an ideal base for vineyards soils: it heats up easily after the winter and regulates beautifully the water supply during summer. The tuffeau drains well, and during the summer droughts, the vine roots can still find enough humidity to help the grapes ripen well. Differences in the soil texture, in the depth of the tuffeau, in the exposition, in the distance from the Loire, in the altitude, plus the plant’s origin and, of course, the age of the vines, all these things give a different potential to each plot. It’s because they love our tuffeau that the Chenin and the Cabernet Franc became the favorite grape varities throughout the Saumurois and Touraine.